We’re a registered migration agency, so we help people find out if they’re eligible for a visa and help them prepare and manage their visa applications, we do this both for individuals and businesses. We essentially prepare the whole package and lodge it with immigration for them. It’s a very interesting area to work in, we get to meet many different people from all around the world and everyone’s story is different. We’re experiencing an increase in demand lately as there have been lots of big changes recently; yes it is, quite a lot more difficult now! How long have you been at the centre? We’ve been at the centre since August this year, so only a couple of months. 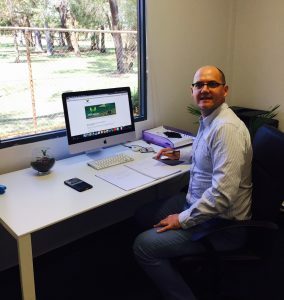 I was in between two places – I had an office in Osborne park and I was using a co-working space in the CBD and found I needed my own office, so I decided to come here. What attracted you to the Stirling Business Centre? Good question! I really like that I have the chance to collaborate with other businesses and network. I’m glad I’ve become a part of the Stirling business community as I live nearby so it’s good to be a part of the local community. Also, I can cycle here; it only takes me 10-15 minutes, so I can get in the fitness and save petrol and the environment. It really makes the start of my day much happier and active. What do you like the most about the centre? The events and networking opportunities are good. It’s nice getting to know other business owners you can bounce ideas off each other when you have lunch. It’s also great that the centre has a link with the Stirling Business Association. For me the location is very important, it’s near a park and the freeway. It’s very quiet and easy for my clients to access so that we can do on-site assessments. The meeting rooms and the reception service is good as well, Andreea always knocks on my door when a client is here which is helpful.